The two films have a lot in common, beginning with their titular characters. 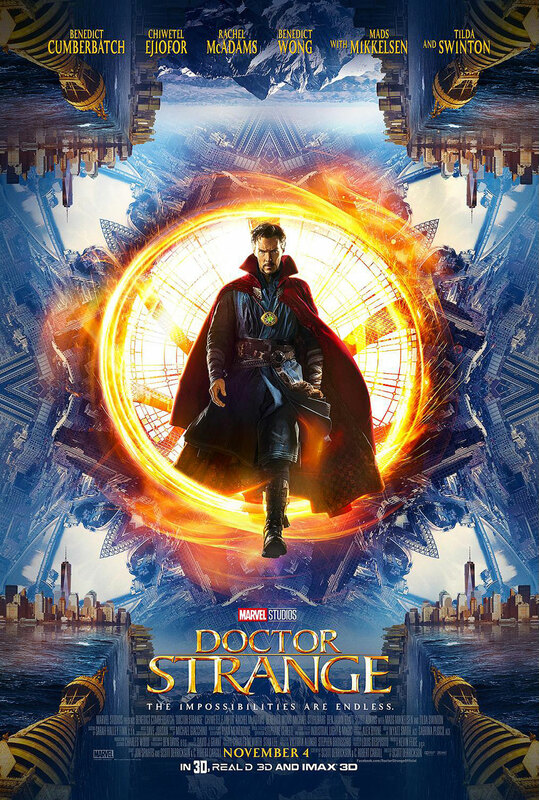 Like Tony Stark, Dr. Stephen Strange (Benedict Cumberbatch) is a bit of an egomaniac – a brilliant neurosurgeon whose own hubris leads to his downfall. After he’s injured in a near-fatal car accident that renders his hands unusable, Strange tries every surgery and experimental treatment available in an attempt to save his career. When traditional medicine fails him, the bitter and defeated Strange goes looking for a miracle cure in Nepal, where he’s introduced to the Ancient One (Tilda Swinton), a powerful sorcerer who commands a mysterious order of warrior monks, including Karl Mordo (Chiwetel Ejiofor) and Wong (Benedict Wong), charged with protecting Earth from supernatural threats. Though Strange is skeptical at first, the Ancient One opens his mind to the infinite power and knowledge that the universe contains, ultimately taking him on as a student of the mystic arts. But after a former acolyte named Kaecilius (Mads Mikkelsen) steals a forbidden ritual from the Ancient One and goes rogue, amassing his own army of zealots to bring about world destruction, Strange must put aside his selfishness to help stop him. At first, “A Bigger Splash” is a feast for the senses. The gorgeous locations, thrilling tunes, and nothing but good times with Tilda Swinton’s rock star feels like paradise. Midway through director Luca Guadagono’s hypnotic film, however, the dream begins to turn into an equally exciting and unnerving nightmare. Marianne Lane (Swinton), unlike her former lover Harry (Ralph Fiennes), is speechless. After the rock star undergoes a potentially career-ruining procedure, she seeks some peace and quiet with her boyfriend Paul (Matthias Schoenaerts). They lie about in the sun, make love any chance they get, and, at least on the surface, the two couldn’t look happier. Their brief moments of peace and quiet are interrupted when Harry stops by with his “daughter” Penelope (Dakota Johnson). Harry, Paul and Marianne all share a history together — one that slowly reveals itself over the course of the narrative. Until the surprising but inevitable third act, that’s about as much plot as there is in “A Bigger Splash,” a film that’s driven far more by atmosphere and character. David Kajganich’s script may feel like a rambling assortment of scenes, but they’re all of a piece, always serving a purpose or revealing something about the characters. When Harry lets loose to some Rolling Stones in a joyful three-minute dance sequence, we see the man Marianne used to love. That man, the one that always tries to live his life to the fullest, comes and goes throughout the film, like all four of the central characters.